India is the world’s largest democracy, but it is also a country with widespread chronic poverty and growing inequality. For more than a decade, the Mahatma Gandhi National Rural Employment Guarantee Scheme (MGNREGA) has promised the possibility of dignified employment to the rural poor. Yet this bold program has run into the realities of powerful interests and weak oversight. With support from IBP, the civil society organization Samarthan has worked to strengthen implementation and accountability for MGNREGA in Madhya Pradesh. In doing so, Samarthan has made use of multiple tactics and tools, including contributing to hundreds of social audits. But the organization has also had to navigate a complex and fragile accountability ecosystem and find ways to strengthen it at the same time. Is Samarthan’s work only addressing the symptoms of the problems with MGNEGRA? Or is the organization helping to address the root causes of structural inequality? 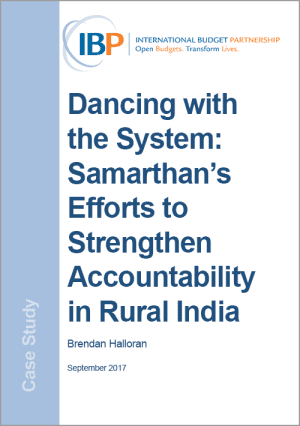 This case study speaks to these questions through brief exploration of Samarthan’s recent efforts.